I’m about to make a confession, one which may cause many of you who are reading this to click away now. That confession is that I am a fan of I’m a Celebrity. I’m not sure what it is about that program but I genuinely look forward to watching it each year. In my opinion, this year wasn’t a great vintage, however, while watching and thinking about this months' Applied Influence Group topic (perception) I became acutely aware of how powerful your initial perceptions can be and I realised that I had fallen into a common trap; I had made an error in judgement regarding one person in particular. In other words, I had fallen victim to a psychological phenomenon first identified by psychologist Ross in 1977, known as Fundamental Attribution Error. In this post, I will explain what Fundamental Attribution Error is and explore how we may be able to combat the issues it can generate. I fell victim to this fundamental error when assessing the winner of this year’s competition. Toff; the name, for one, had me attributing certain criteria, but initial quotes such as “I’m like a jungle Barbie” had me making assessments with very little information to test it against, just what I was being spoon-fed by ITV. My initial perception of her was not a good one, the reason, I had made an error. The proof of this error was confirmed to me as by the end of the show I had a totally different opinion of her. So how had I made that error and more importantly how could I have avoided making such an assessment? Error – Refers to the fact that making an assumption between the behaviour we see and the attitude that the behaviour is perceived to represent, is an error. The research indicates that we have a tendency to assume that the behaviour we see (for example, edited TV coverage) corresponds to the individual's real attitude regardless of the situational constraints. We then stick to this assessment or, in some cases, go out of our way to prove that the assessment we have made is correct. Consensus - Is everybody else behaving in this way? Consistency – Do they often interact in this environment / in this way in that environment? Distinctiveness – Is this how they normally behave? The above questions may be difficult to answer, especially if it’s the first time you are meeting somebody. But if we consider how powerful our initial perceptions are, allowing some consideration for the above points may help to reduce the effect of a fundamental error that could directly impact your ability to influence. 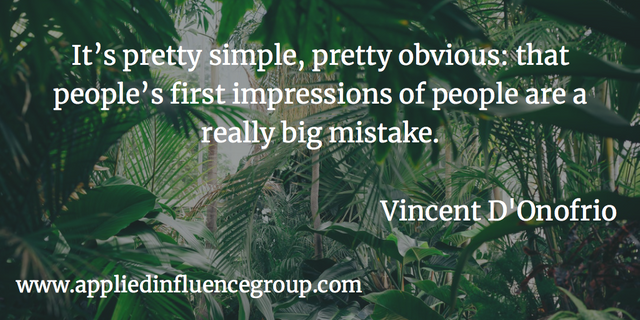 It’s pretty simple and pretty obvious: that people’s first impressions of people are a really a big mistake.